Keep an eye out for the return of more NT Live screenings. If you would like to be added to our mailout list please email us at promotions@statecinemas.co.nz. Weekly on a Thursday evening we screen a popular Chick Flick from our current Now Showing selection and add in a special treat - for only $21.00 you can enjoy a Chick Flick while sipping on a delicious glass of Wine (or enjoy a Beer or Juice) from Stefano's special 'Chick Flick Drinks Menu'. An opportunity to get your friends together for a night out at the movies or if you are looking for that special gift idea, we have Chick Flick Gift Vouchers available. 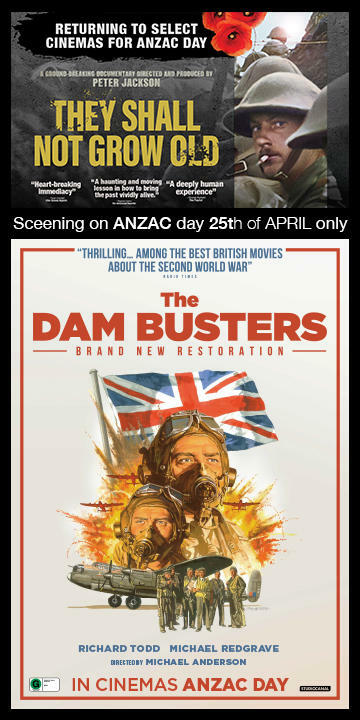 Email promotions@statecinemas.co.nz to join the mailing list for more details. A Mums and Bubs film screens on the first available Wednesday of each month, (outside the School Holidays). Especially for parents with little babies, this is an opportunity to watch a movie in a baby friendly cinema which has less volume and a little more light. We have baby changing facilities upstairs near Cinema 4. Please note that by law babies are not allowed to attend R rated films. 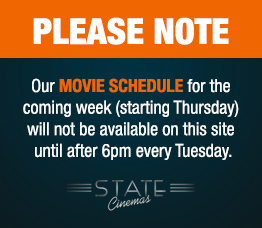 To join our mailing list, please contact promotions@statecinemas.co.nz. Impress your clients or reward and motivate your team with an exclusive movie event! You can host your next event at the Suter Theatre in Bridge Street or, if our programming allows, at State Cinemas. A movie night is a flexible fundraiser that can be tailored to meet your club’s needs. Very simply, the plan is to encourage attendees to watch a movie together and utilise the gathering to raise funds for your club. A club can aim to make money off the movie tickets, the food and catering or upon raffle tickets sold on the night.